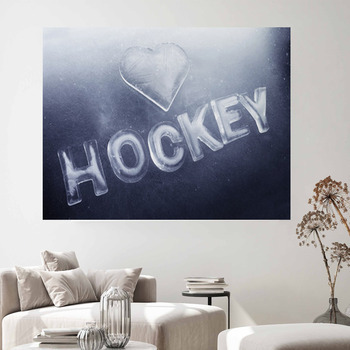 Playing hockey isn't a hobby, its a way of life, and that's why you need our custom size hockey wall art. 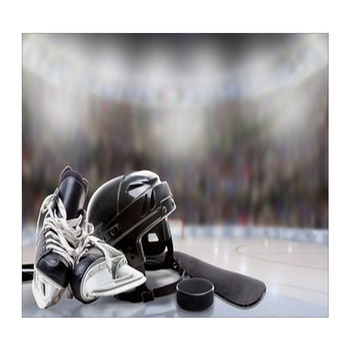 What's your favorite aspect of hockey? 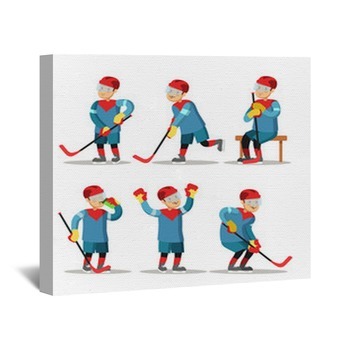 Is it goalkeeping? 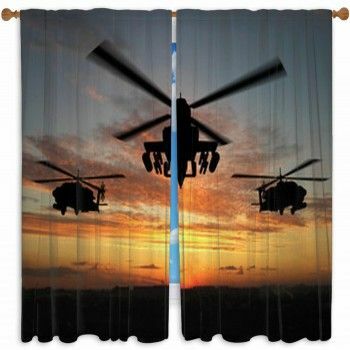 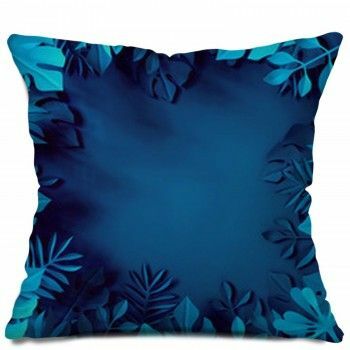 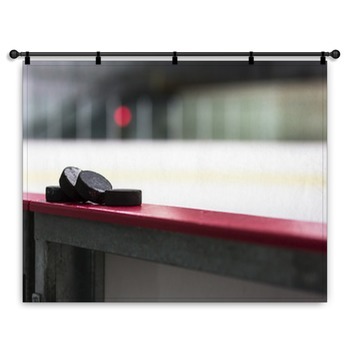 Then adorn your walls with posters or microsuede wall tapestries displaying a rugged pencil drawing of a goalie doing a split to snag a puck in his glove, with the word hockey written in bold letters and a goalie mask in the background, the photographic profile of a goalie poised between the pipes, waiting to deflect all shots, or an illustrated goalie staring down the enemy with his intimidating mask. 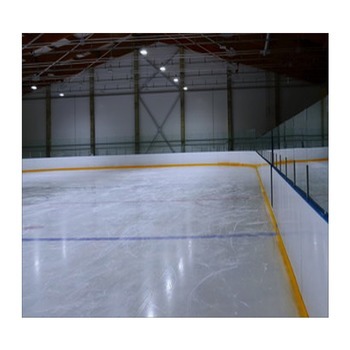 Or do you prefer passing and scoring? 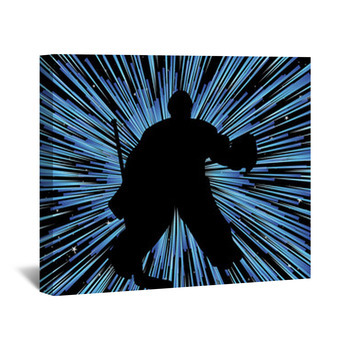 Then you'll love our wall art featuring wingers and centers launching the puck. 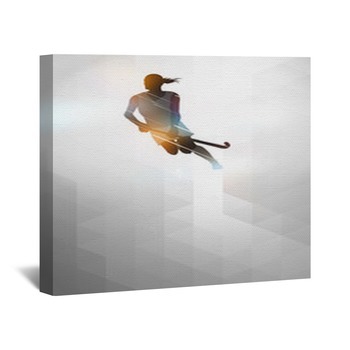 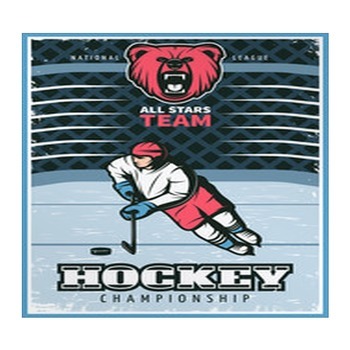 Choose wall stickers, hockey themed wall murals, artistic design boards or stand outs of the silhouette of a hockey player charging towards you with the puck under control of his stick, an illustrated player in red and blue waiting for a pass that he will turn into a goal, or a collage of hockey players in different colored uniforms racing across the ice. 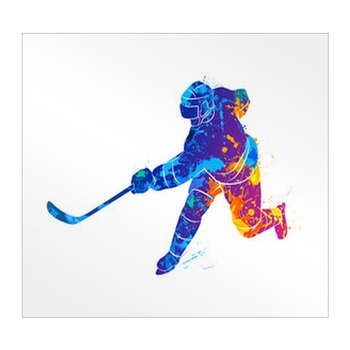 For simpler, starker wall art, pick two helmets, one black and one white, lying on the ice beside two sticks, with a puck between them, a cartoon hockey stick smacking a puck and leaving a bright orange burst, or the close-up of a puck smashing through glass. 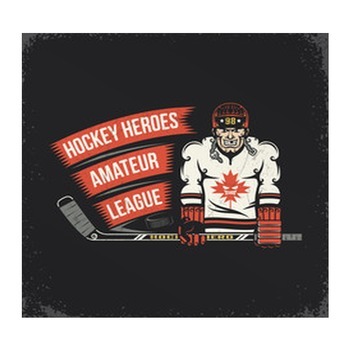 Whether your kids love hockey or you're trying to get them to start playing and watching the game, encourage them with art boards, gallery wraps and our other hockey wall art, including cartoon hockey players with funny faces and kids playing on a lake in winter clothing. 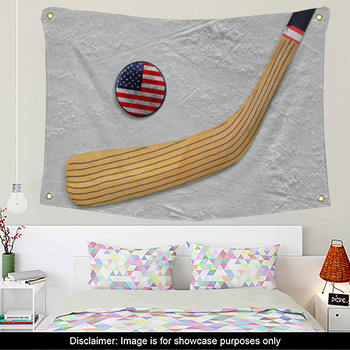 Hockey requires skill, toughness and dedication, so keep hockey on your mind all the time by turning your bedroom, living room or entire home into a shrine to the greatest sport in the world.